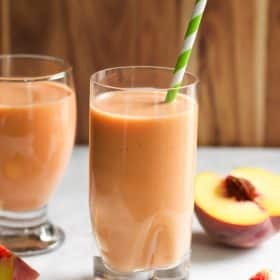 This Peach Carrot Smoothie is healthy and delicious and has only four ingredients; banana, peach, coconut water, and greek yogurt. Enjoy! I love smoothies every time of the year. 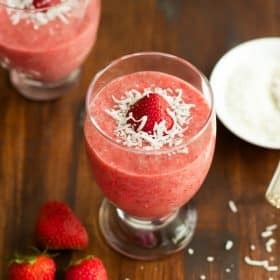 Some of my favorite recipes I’ve already posted here on my blog are my Strawberry Papaya Smoothie and Spicy Pineapple Peach Smoothie. 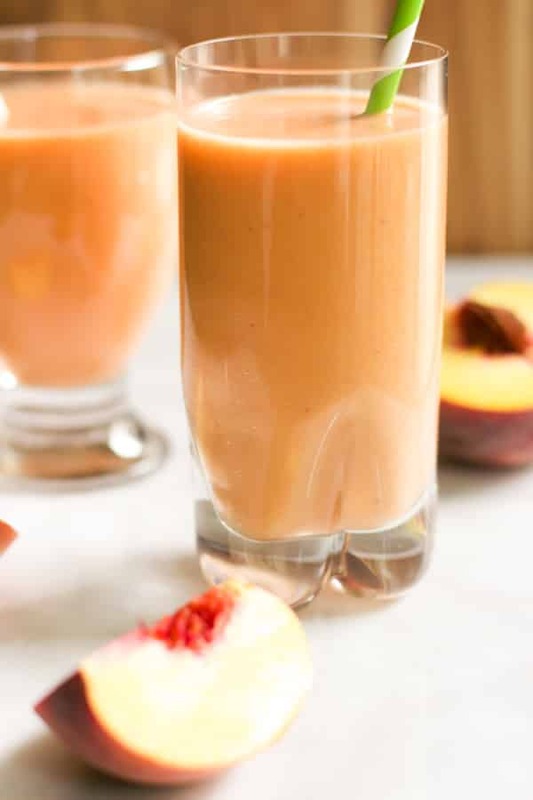 For me, one of the best fruits to add to a smoothie is definitely peaches. They are so sweet and in many cases, you don’t even need to add sugar to make a flavorful smoothie. This time, I decided to add carrots as well. I’ve gotta be honest with you guys, I am not a type of person who likes to eat raw veggies. 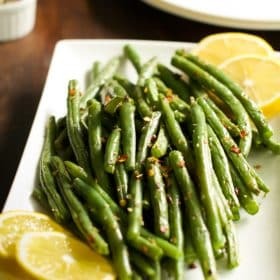 I mean I LOVE veggies, but I prefer to eat them when they are cooked. Maybe the reason why is because where I grew up in Brazil, it is not very common to eat raw veggies like here in North American. However, we do eat lots of veggies. I mean LOTS all the time since Brazil is a tropical country where everything grows year round. Many times I watch my husband eating a huge bowl of baby carrots and I just think: “How he can do that!!? ?” I really admire a person who likes to eat raw veggies because of course, they have more nutrients than cooked ones. But I am pretty happy already because after living 4 years together with him, I already got used to eating raw peppers and broccoli, which is awesome! But, I still have a hard time to eat raw carrots and celery. Two weeks ago, he had to travel for work and I was alone at home thinking: “what I will do with the bag of baby carrots in the fridge?? 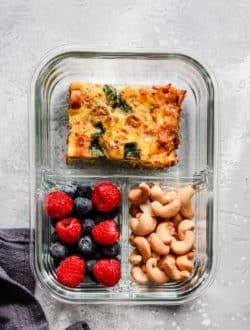 !” I had to think of some recipe with carrot because I hate throwing food in the garbage. When think about that, I just remember my mom saying to me when I was little: “please eat everything on your plate because there are so many kids in this planet that don’t have anything to eat”. I bet all our moms said the same thing to you once during our childhood, right? So, I thought of making a smoothie because the carrot is still raw, but to camouflage the raw flavor, I had some natural sweetener from the peach. And guys let me tell you: THIS SMOOTHIE ROCKS!! I loved it so much that the next day, I made the same recipe again for breakfast!!! 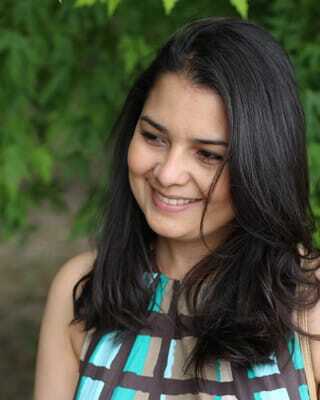 Love, love, love!!! If you prefer, strain the smoothie to make it even smoother. 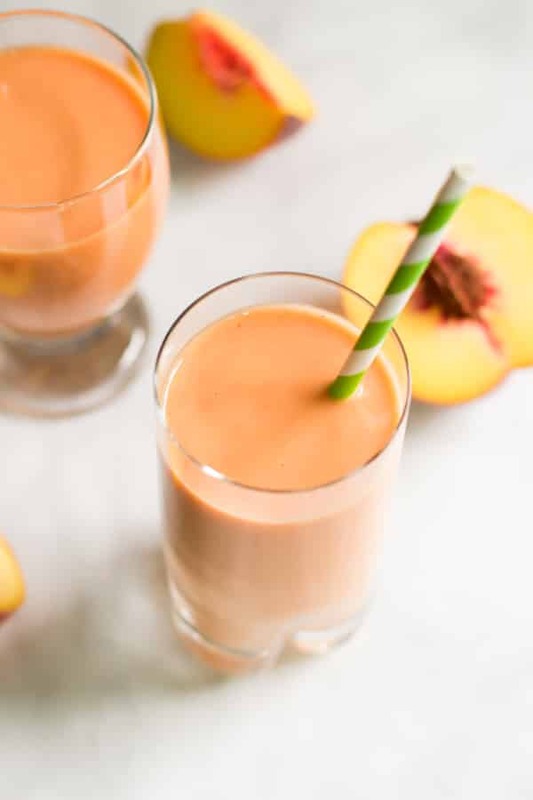 So, I hope you enjoy this Peach Carrot Smoothie recipe and try to make some in your own kitchen today. 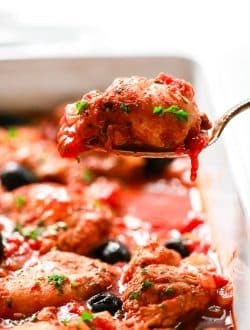 If you like this recipe, please share with your friends and family. Do you want to taste more? 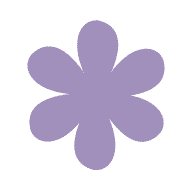 Subscribe to my newsletter and follow Primavera Kitchen on Twitter, Pinterest, Google+, Instagram, and Facebook for all delicious recipes updates. As always, I really appreciate you stopping by. 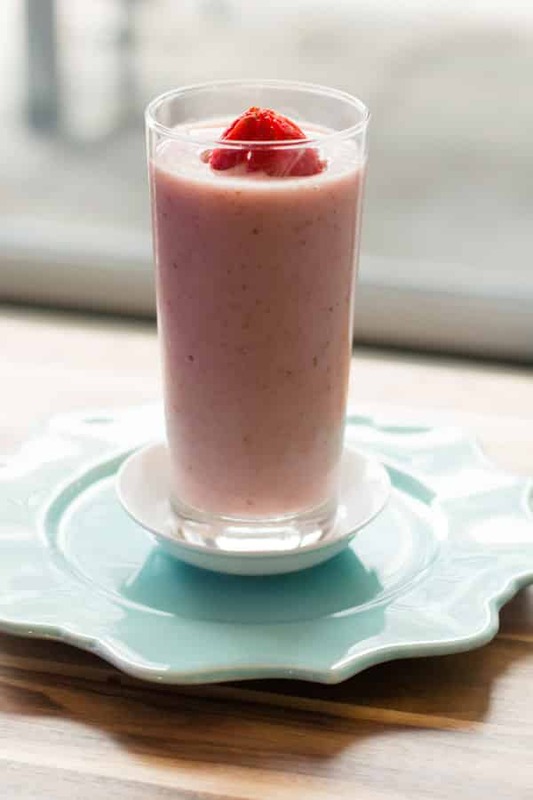 Start your day off with this Strawberry Papaya Smoothie! 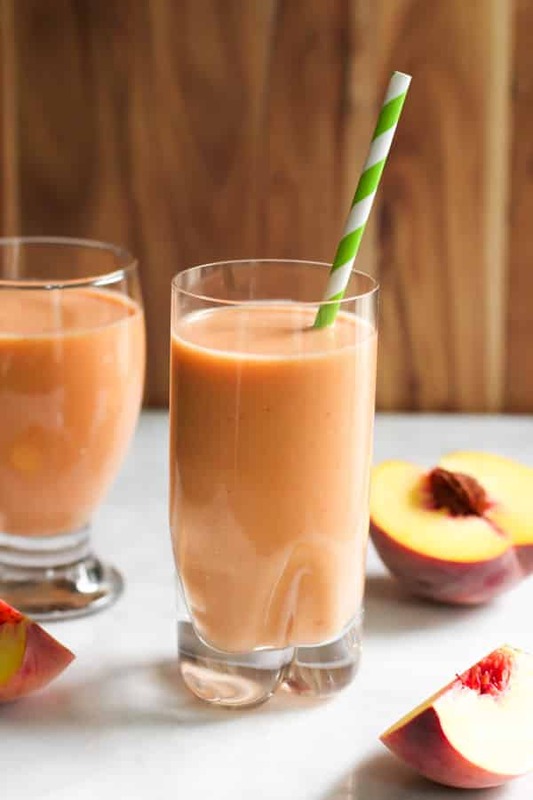 This Spicy Pineapple Peach Smoothie is another way to start your day! 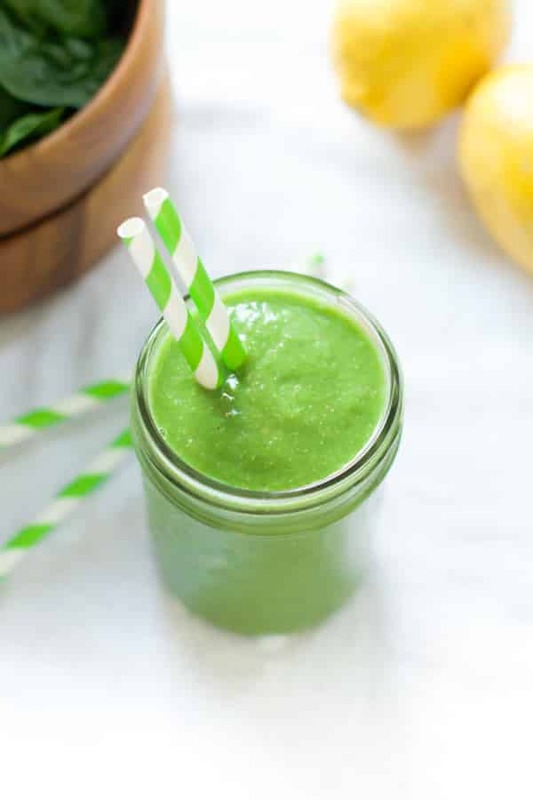 Try this nutrient-packed pineapple green smoothie for breakfast! Great flavor combination Olivia. Thanks for a new smoothie recipe. I’m a cooked veggie kind of gal also! But I probably wouldn’t say no to one of these smoothies! Love peach anything. I love this smoothie flavor, Olivia! Such a great combination and gorgeous color, too! Definitely trying this one out. Pinned! I adore peach and carrot smoothies, and had never thought to combine the two into one delicious bevvie. This smoothie looks amazing, dear! So creamy and full of flavor! This looks divine I just want you to know you don’t actually have the carrots listed in the ingredients though. Olivia! This smoothie rocks! Love the flavor combo and the pretty peachy color! Pinned! I like raw veggies, but only a few of them. Most I prefer cooked! I don’t think I’ve ever had a carrot in a smoothie! I bet it goes really well with fruit since they can be sweet, too. I don’t see the carrot listed in your recipe though. How much do you add? Thanks, lady! YUM! Delicious! I need to make this!!! I had never thought to add carrots to a smoothie! But why not? They’re sweet, and full of nutrition. I bet this tastes amazing. Lovely combination of flavors for this smoothie! And look, you’re getting your raw veg in there! HA! I think I prefer to drink my raw veggies. One can get so many more in that way! Thank you, Olivia! This is delicious! 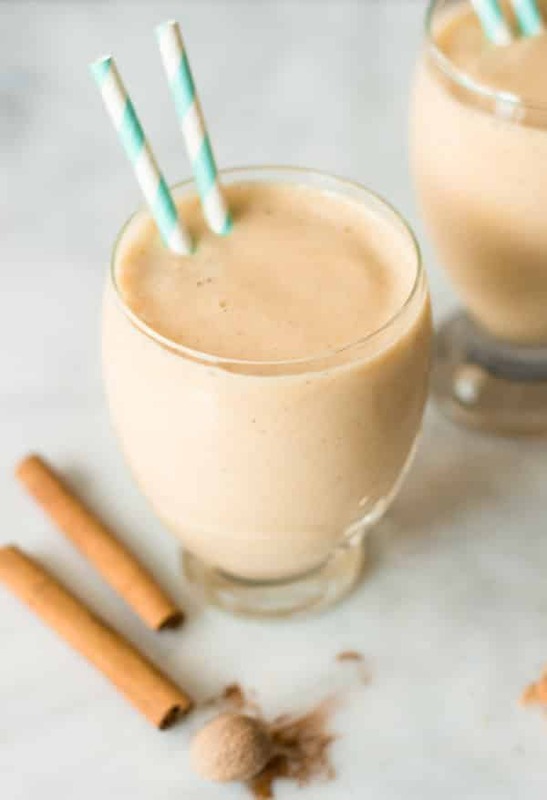 Smoothies are a go-to breakfast for me so I’m always looking for new combos! 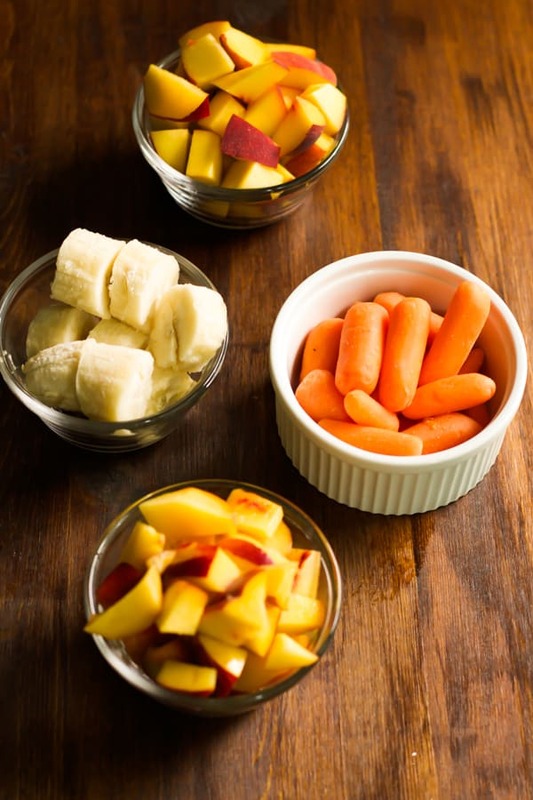 Peaches are a favorite of mine as well … and I love the addition of carrots! Plus, it’s so pretty! Smoothies are a go-to breakfast for me too, Ashley! Peach and carrot are great together. 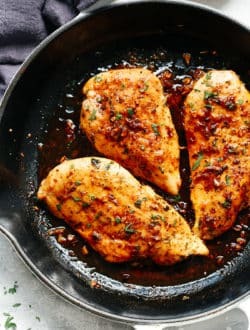 ou would love this recipe! Ok, so excited! For one because I found you through Sarah’s blog after her blog tour post (I was the one that nominated her so it was fun to see who she nominated) As soon as I saw one of your photos I knew I would love you, that healthy food photography sucked me right now! Loving this smoothie, totally would have never thought of adding the carrots in, but they are sweet so why not! 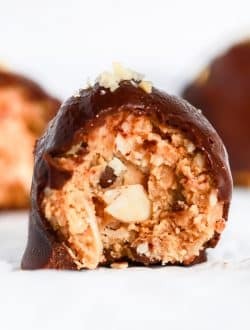 Definitely making this one soon! Love the flavours Olivia!! Smoothies are always a go to for me, and just tonight I was looking for a new flavour to try. I’ve got to try this one. Glad you like this recipe, Jess! love your comment! Thanks a lot, Tash! Great idea to add the carrot. Peach smoothies are my favourite and this sounds delicious. I have to say that I’m one of those people who love eating raw veggies! I never thought to add carrots to a smoothie, but I think I’m going to have to try this in my next smoothie. I bet they add a beautiful colour too – maybe even a great thing to add to a “green” smoothie? I just made this smoothie and I LOVE IT!! I never thought to add carrots to a smoothie. Thanks for the recipe! Just wanted to let you know that you have this listed as dairy free but the Greek yogurt is dairy. But I totally going to try this smoothie today! I made your peach smoothie today ! It was terrific! Just what I needed this afternoon! And I too….LOVED LOVED LOVED! 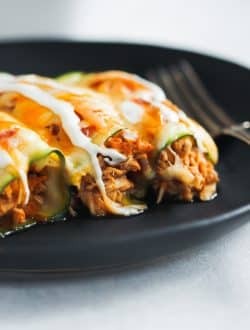 So glad you enjoyed this recipe! 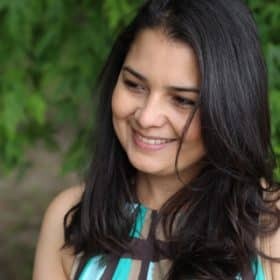 Thanks for stopping by to comment! This recipe sounds delicious. I love the taste of raw carrots, so it will be an asset rather than something that needs to be covered up. BTW, Greek yogurt is made using cow or goat milk. I can’t have dairy, so I will substitute canned coconut milk. Yum! Can I sub anything for the coconut water? I’ve tried it and I just can’t get my taste buds behind it. I’m sure it will mix in for most people but not me. You can use only water or orange juice or even beet juice. Do you think an immersion blender would work to chop the carrots up? I’ll try some peach yogurt maybe and see what juice i have on hand. may be the one way I can start to get more veggies! I think it may work but I can’t say for sure because I’ve never made it with an immersion blender. 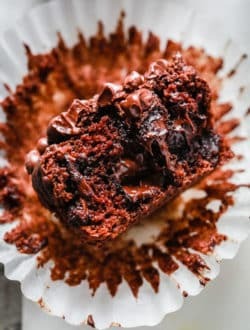 This looks interesting and yummy. I’m planning on giving it to the kids to sneak in some extra veggies. I wanted to try it this week but my husband came home from the grocery store with canned peaches. Would the taste come out the same? Just wondering if I have to peel the peaches? If you have a powerful blender you don’t need to peel the peaches.